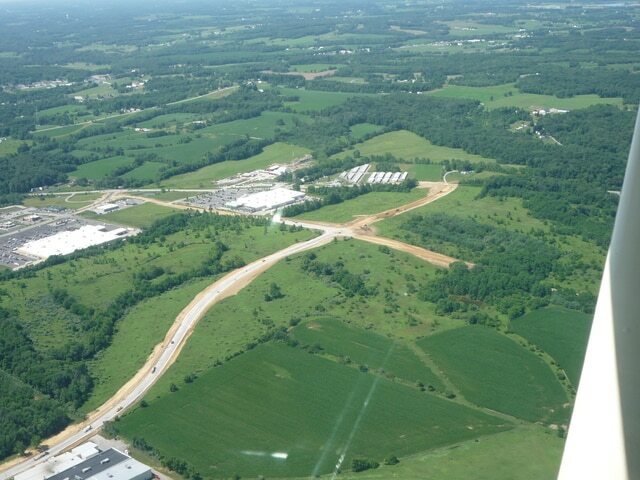 Lynchburg resident Ralph Widman provided this recent aerial photo, taken from about 1,000 feet, of the new access road project on Hillsboro’s north side. Looking west from the bottom of the photo, it shows Carl Smith Drive heading toward SR 73 near the top of the photo. On the bottom right is the PAS Technologies facility and the larger building in the upper left corner is Lowe’s. Last month’s rainy weather slowed work somewhat on the new access road project on Hillsboro’s north side, but Highland County Engineer Dean Otworth said Wednesday that there is hope the project will be completed before its original projected end of August 2016 date. When completed, the new Carl Smith Drive will run from the end of Hobart Drive west to SR 73, just north of the SR 73 Self Storage. Heading east, Carl Smith Drive will run from SR 73 past Homestead Avenue into Hobart Drive and then Hobart Drives empties onto U.S. 62 north, or North High Street. Basically, there will be one continuous road from U.S. 62 to SR 73. The project also includes improvements to Careytown and Harry Sauner roads, along with a “roundabout” where Carl Smith Drive will intersect with Careytown Road. Otworth said that when work started at the beginning of June that closed Careytown Road, the John R. Jurgensen Company of Cincinnati had a 90-day window to complete that part of the project. He said that while the company is entitled to rain days, the Careytown Road work is on schedule to be completed before the original 90 days expire. As part of the Hobart/Carl Smith Drive extension, construction will include improving the intersections with U.S. 62 and SR 73 by installing turn lanes on both routes; installing a traffic signal at the intersection with U.S. 62; improving Careytown Road with the construction of a roundabout; and improving Harry Sauner Road at its intersection with Careytown. Otworth said work is also currently underway to widen SR 73 for right and left turn lanes. The improvements on Harry Sauner Road will be from SR 73 to first traffic signal. For more information about the roundabout, visit www.highlandeng.org. Preliminary plans for the Hobart/Carl Smith Drive project began in January 2007 when Otworth approached the Ohio Department of Transportation with a vision to improve the area’s transportation network by extending the existing Hobart Road from its terminus near U.S. Route 62 at the northern corporation limit of Hillsboro to SR 73. The Jurgensen Company was awarded a contract for approximately $6.9 million to construct the new road.